The Construction and Forestry Technology (C&F Tech) curriculum follows the general HEATT curriculum standards; however, the material is concentrated on the needs of John Deere construction equipment dealers. The program is designed to be a two-year Associate in Applied Science (AAS) degree. John Deere dealers from NC, SC, VA, and WV sponsor students. 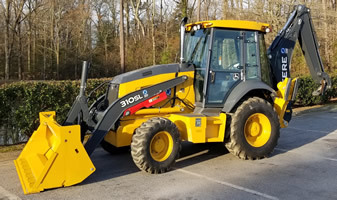 Wake Tech is one of seven community colleges that provide instruction on John Deere construction and forestry equipment. John Deere’s C&F Technician Website - Build your future with John Deere C&F Tech and learn the machines that get the big jobs done: backhoes, excavators, dozers, loaders, motor graders, scrapers, articulated trucks, and more. John Deere's network of dealerships sponsor students at schools across the country. James River Equipment Inc. Home office is located in Ashland, VA.
C & F TECH provides unique opportunities for both the student and the dealer sponsor. To find out how you can receive reimbursement for books and tuition, earn a tool set (or get it at cost), or start a career in a growing field, contact Paige Kearns at 919-866-5257, or [email protected].